The 15th Light Horse Regiment was formed as part of the 5th Australian Light Horse Brigade attached to the Australian Mounted Division on 26 July 1918. This Regiment was formed predominantly from the members of the 3rd Battalion, Imperial Camel Corps. In addition to the three active squadrons in Palestine, in Egypt there was the 15th Light Horse Training Squadron which was formed in July 1918. It supplied reinforcements for the 15th Light Horse Regiment. 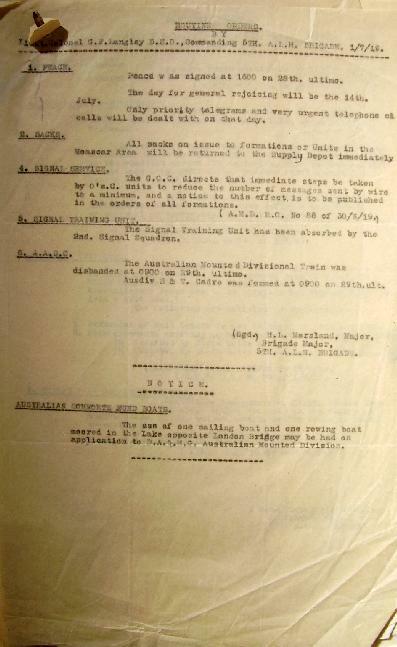 The earlier systems proved to be ineffective so to assist with identification of the men in the various units within the AIF, Divisional Order No 81 (A) Administration was issued at Mena on 8 March 1915 detailing the Colour Patch for the 15th Light Horse Regiment as others received their colours. The colour patch was made of cloth 1¼ inches wide and 2¾ inches long and worn on the sleeve one inch below the shoulder seam. 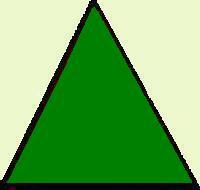 The first colour patch for the 3rd Battalion, Imperial Camel Corps was a blue triangle. This was initially worn by the men from the 13th and 14th Camel Companies which became the 3rd Battalion. 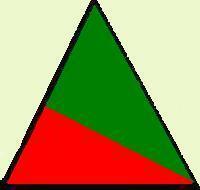 The 15th Light Horse Regiment as part of the 5th Australian Light Horse Brigade, Australian Mounted Division, carried the Imperial Camel Corps triangle patch with the red Brigade colour as the lower triangle part of the colour patch, while the green colour was on the top. This is illustrated with the above presentation. On 19 September 1918 the Battle of Megiddo began. The infantry over ran the Turkish defensive trenches allowing the cavalry to debouch into the Turkish hinterland. The 15th Light Horse Regiment participated in the breakthrough which moved rapidly through the north of Palestine. At the end of the first week, it was obvious that the way to Damascus was open and so a second push occurred on the heels of the first assault. On 1 October 1918, Damascus was taken. After a rest in Damascus, the 15th Light Horse Regiment moved towards Homs when the Turks surrendered on 30 October 1918. After the conclusion of hostilities, the 15th Light Horse Regiment was marked to return to Australia. Prior to that action, one of the saddest actions occurred for the Australian Lighthorsemen, they had to farewell their best friends, the horses. All the Light Horse unit horses' health was ascertained with the fit horses being transferred to the Indian Cavalry while those in poor condition were destroyed by the Veterinary units. On 13 March 1919 the 15th Light Horse Regiment was deployed to assist in suppressing the Egyptian Uprising. 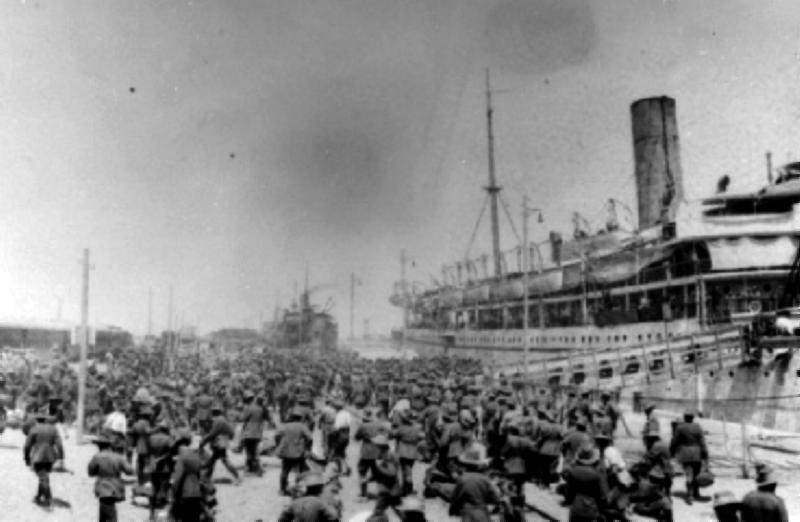 When the revolt collapsed, the 15th Light Horse Regiment embarked on the 24 July 1919 for the long voyage to Australia where the unit was disbanded. As the successor of the 3rd Camel Battalion, Imperial Camel Corps, the 15th Light Horse Regiment also inherited the battle honours. 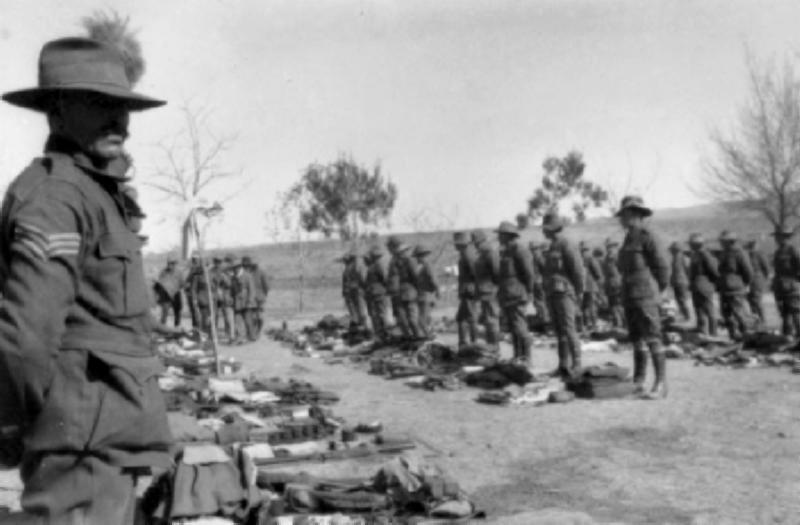 15th Light Horse Regiment War Diaries. 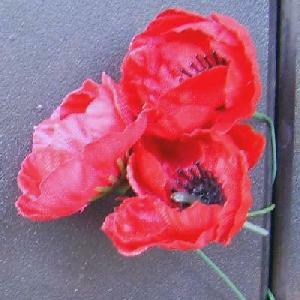 The Roll of Honour contains the names of all the men known to have served at one time with the 15th Light Horse Regiment and gave their lives in service of Australia, whether as part of the 15th Light Horse Regiment or another unit. Roy Bunbury ARMSTRONG, Died of Disease, 30 October 1918. Frederick Joseph BAILEY, Died of Disease, 1 November 1918. Charles BASKETT, Died of Disease, 13 October 1918. Arthur Stanley BATSON, Died of Disease, 14 October 1918. William Joseph BEER, Missing, believed Killed in Action, 19 September 1918. Albert Joseph BOND, Died of Disease, 1 November 1918. Richard Harwell BRYANT, Died of Disease, 4 November 1918. Richard Leslie Oliver BUTTERS, Died of Disease, 22 November 1918. Daniel Ruben CURTIS, Died of Disease, 23 February 1919. Richard Clarence GREEN, Died of Disease, 25 October 1918. Robert Walter HAWKES, Died of Disease, 3 November 1918. Leslie Sylvester HOWARD, Died of Disease, 3 October 1918. John LYONS, Died of Disease, 17 October 1918. John James MCCARTY, Died of Disease, 4 November 1918. Walter George Lowing MCMILLAN, Died of Disease, 21 October 1918. William Thomas PAPWORTH, Died of Disease, 5 December 1918. George Frederick WEEDON, Died of Disease, 1 November 1918. Harold WRIGHT aka Harold HARRIS, Died of Disease, 27 October 1918.